First things first: before we get too far into this, you’ll want to go ahead and download my sample budget format for Excel so you can quickly and easily follow this post. Right click the link below and save the sample budget template to your computer. 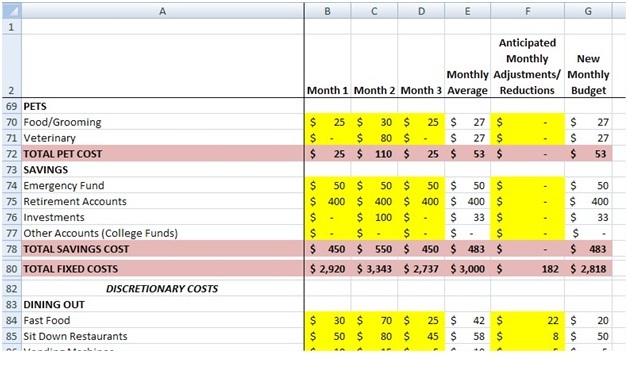 Now that we’ve got that out of the way, let’s talk about how you can quickly and easily create a budget in excel using the sample budget you just downloaded. Keep in mind, this assumes that you already have a general idea of how much you’re spending and making each month. If you’re not to this point yet, don’t worry, I’ll tell you how to do this in another post. In my spreadsheet, I’ve entered three months worth of my cash inflow (i.e. the money I make) and my cash outflow (i.e. my monthly expenses) on a tab that calculates my baseline income and expenses. If you’re using a different budget template or some sort of budgeting software like Quicken, your template or software likely has a similar section. If you don’t have the template already open, you can see a screen shot of my input tab below, populated with fake data, of course. What a sample budget might look like in Excel. In Column A I have listed the “type” of income or expense you have on a monthly basis. The expenses and income classifications in here are pretty generic, so feel free to update your template to reflect your own individual needs, whether that means adding some rows or deleting others. If you’re using software like Quicken, you should be able to add/delete pretty easily, too. Columns B, C, and D correspond to each of your three months of income and expenses (see my statement above where I said I had three months worth of income and expense information). Some templates/software might just have one month, others might have more. In Column E, my workbook automatically averages out the three months worth of data. This gives you a feel for what a typical month is like since it will “smooth out” any anomalies or outliers that might have occurred during any particular month. That being said, it doesn’t smooth them out so much that your projected expenses aren’t somewhat artificially high, tricking you into trying to save more money. 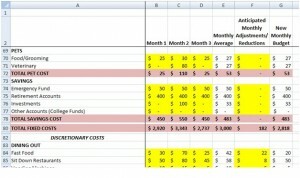 Columns F and G are where you put your projected monthly costs savings and calculate your new monthly budget. If you’re at a loss for ways in which you can come up with monthly savings, please feel free to check out all of the posts on this blog, since that’s what it’s here for! 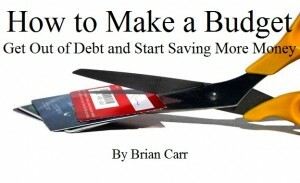 If you want to learn more about creating a budget, click this pic to head over to Amazon. So, if you’re still with me – congratulations, after going through this exercise you now have the baseline for your budget! Now you can start figuring out where you can begin cutting expenses so you can keep more of your hard-earned money! Again, check out some posts on this site if you’re not sure where to begin. You’ll be surprised at how easily you will be able cut expenses without really affecting your lifestyle! Hopefully you’re already ahead of the curve and have more money coming in than going out. If that’s not currently the case, now that you know where you’re spending your money, you’ll be able to make prudent decisions as to where you can begin to cut back, which I will get into in another post. If you would like to learn more about how to make a budget and where you can save more money each month, please check out my ebook for the Amazon Kindle by clicking here!